This is the homepage of the Scenter mod. Scenter is a universal mod for Minecraft. 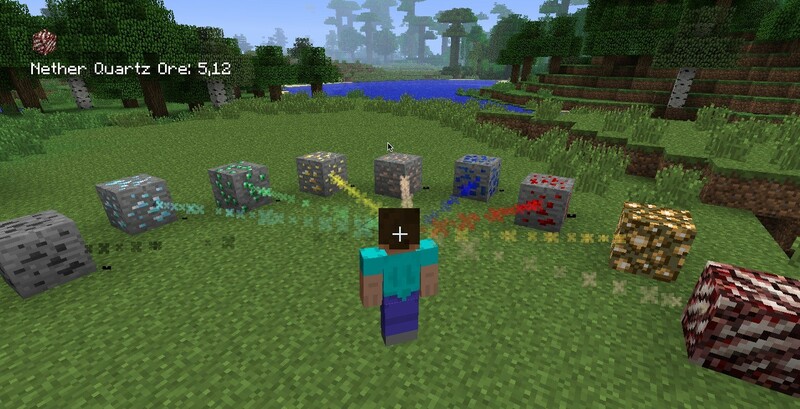 Use the Scenter mod if you want to find (scent out) hidden ores in Minecraft. With the Scenter mod you can easily find nearby ores, like coal, iron, diamond, and more. Whenever you interact with the environment (with left click or right click) Scenter searches 3x3 chunks (that gives 3x3x16x16x256 blocks) surrounding Steve. When it finds a block matching the selected target block, it marks the direct path with a colored particle trail. By pressing 'O' you can select the target block from the following list. You can extend this list by editing the Scenter configuration file (see section "How to Configure Scenter 3.x" below). Install Forge (you have just to double click the minecraftforge-installer-*.jar file and follow the instructions). Since version 3.2.0 this mod can be installed on server also. Its main purpose is to propagate its configuration to all clients running Scenter when they connect to the server. This makes sure that all clients have the same configuration. However, a client-side installation is not required to connect to the server. And of course, a server-side installation is not required to run Scenter on the client. This section describes how you could configure Scenter, version 3.1.0 (or later). Please note that Scenter has two separate config files. scenter3.targets.cfg - This file contains the targets (the names of all blocks) that Scenter can find. D:hudX - The x coordinate of the HUD (Head-Up Display). Valid is anything between 0.0 (left) and 1.0 (right). Default is 0.05. D:hudY - The y coordinate of the HUD (Head-Up Display). Valid is anything between 0.0 (top) and 1.0 (bottom). Default is 0.05. S:detectionRange - The number of chunks that are searched by Scenter. Valid values are 1, 3x3, 5x5, 7x7, 9x9, 11x11, 13x13, 15x15. Default is 3x3. B:enabled - Set to true to enable Scenter. Set to false to disable Scenter. Default is true. Scroll down to the end of the file "scenter3.targets.cfg"
adds obsidian as a new target to Scenter. If this single-block target is chosen during gameplay (choose it by pressing the 'O' key multiple times) then Scenter searches the environment for the nearest occurrence of blocks with exactly this name and marks the trail to it with floating particles. For a list of block names please see below. With Minecraft 1.7.x Mojang has replaced the numerical block IDs with (unique) block names. The following spoiler contains a compiled list of all vanilla Minecraft block names. However, other mods might add custom blocks to Minecraft. Search for the line containing "[mickkay.scenter.ScenterMod/Scenter]: These blocks are registered:"
Below that line you'll find a list of all registered blocks. to add Bauxite from Pixemon mod to Scenter. Sometimes there is a block with blank spaces in its name. To add it you have to encpasulate the complete name inside double quotes. to add the white opal ore from OpalsPlus mod to Scenter. adds a new target for stationary lava and flowing lava. If such a multi-block target is activated during gameplay, then Scenter searches the environment for any of those blocks and marks the trail to the nearest one found. adds a target for red wool, green wool, and blue wool. Locate the line with the target you want to change. sets the lava target's color to red (FF0000). You might want to use the Online Color Picker to choose the color code. This section describes how you could configure Scenter, version 2.x.y .Please note that Scenter has two config files of which actually only one is effectively used. Scenter.targets.cfg - This file contains the target definitions for all blocks which Scenter can find. Scroll down to the end of the file "Scenter.targets.cfg"
adds Obsidian (having block ID 49) as a new target to Scenter. The comment ("# Obsidian") will be ignored by Scenter. If this single-block target is chosen during gameplay (choose it by pressing the 'O' key multiple times) then Scenter searches the environment for the nearest occurrence of blocks with exactly this ID and marks the trail to it with floating particles. For a list of block IDs please see the Data values page on minecraftwiki.net. adds a new target for stationary (10) and floating Lava (11). If such a multi-block target is activated during gameplay then Scenter searches the environment for any of those IDs and marks the trail to the nearest one found. adds red wool as a new target. Fixed: Unknown blocks are added as AIR. Fixed: Chest is rendered all black in HUD. Fixed: Blocks with no corresponding block item (e.g. lava) are rendered with black text. Extended detection range: now you can search up to 15x15 chunks. See configuration section above for more info. Fixed: left-click did not activate Scenter in MP. Fixed: some 3rd-party block IDs couldn't be found. The particle trails slowly move into the target's direction. This mod (plugin, a patch to Minecraft source, henceforth "Mod" or "The Mod"), by the terms of http://www.minecraft.net/copyright.jsp is sole property of the Mod author (, henceforth "Owner" or "The Owner"). By default it may only be distributed on minecraftforums.net. It may only be mirrored or reposted (e.g. in a modpack) with advance written permission of the Owner. URL shorteners or other attempts to make money (except voluntary donations) off The Owner's Mod are strictly forbidden without advance written permission. You have to credit me as the author of this mod and add a link to the mod's original thread. You are not allowed to make money with your modpack using url shorteners (like addf.ly) or adds. Donations (e.g. via PayPal) are allowed. You must remove this mod from your modpack if I request it any time later. This is cool. It's too bad it doesn't work for multiplayer. You should make a config so people can add ores or blocks from other mods. Nice. I'll try it out later today. I just tested it and it works great. I didn't find any bugs or errors at all. In fact it works for multiplayer! Just install it on the client side like I have described it above. nice, that's actually really cool. A nice addition would be if you would change the sparkles to correspond with the type of ore, for example, if i'm looking for coal, it should be black, but if I'm looking for redstone, it should be red. Actually, this is really neat. Kind of like a Finder Compass, but more interesting. With release 1.0.1 you can add blocks from other mods now. You just have to know their ID values. I have added a little "how to" to the base article. I am sorry that I can't make an installation video. Most people run Windows, but I run MacOS X. And since they are really different I think it makes no sense. Maybe somebody else can do an installation video an post it here??? However there is a bunch of videos that show how to install forge (e.g. ). But anyway, I checked my installation instructions above and realized that there was an error. I pointed you to the wrong Forge version, I am sorry! Please try it again with Forge Version 6.5.0.489 (if you use Minecraft 1.4.6 and Scenter 1.0.1). I don't like the idea of this working on servers, it's just going to be another thing for server admins to watch out for because it is technically cheating, it is showing someone where all the ores are when everyone else (That doesn't cheat) has to find them legit. I also don't like it because unlike x-ray people won't dig straight towards the ore and make it obvious. It makes them able to mine in a straight line and then turn so it looks like they were actually just mining. Indeed. Make a server part so server owners can disable the mod. Or just disable it in general. Nice mod man better than X-Ray in my opinion. It demonstrates the work of Scenter 1.0.0 from first person view. Although it seems the author did not know that he could switch between the ore types by pressing 'O' repeatedly. And he calls it "too overpowered". I like the idea that you can actually "smell" distinct ores. I just don't know how to colorize the floating particles right now. I'll see if I can add this to one of the next feature releases. We should be able to find obsidian with this mod just a suggestion. Really cool mod I was looking everywhere for a xray that worked with forge, and i couldnt find one, and this was a great replacement, maybe you could add a gui instead of toggling through each ore, so you can select one. This would help especially if you have like 30 different ores from a mod that you added, it would be a pain to scroll through them all.